For the first time, southern sea otters’ numbers have exceeded 3,090, which is the threshold that must be exceeded for three consecutive years in order for the U.S. Fish and Wildlife Service to consider removing the species from Endangered Species Act protections. However, localized population declines at the northern and southern ends of the range continue to be a cause for concern among resource management officials. This year’s survey results suggest an increasing trend over the last five years of more than 3 percent per year. The population index, a statistical representation of the entire population calculated as the three-year running average of census counts, has climbed to 3,272, up from 2,939 in 2013. The growth is accounted for by an unexpected jump in numbers in the center of the sea otter’s range, an area that spans the Californian coast from Monterey south to Cambria. In addition to the sea otter population along the mainland coast, the USGS also surveys the subpopulation at San Nicolas Island in the southern California Bight. This population, established by translocation in the late 1980s, struggled at low numbers through the 1990s, but over the last decade has been growing rapidly with a mean growth rate of 13 percent per year. “The sea otters at San Nicolas Island continue to thrive, and some may eventually emigrate to and colonize other Channel Islands in southern California,” says Brian Hatfield, the USGS biologist who coordinates the annual census. Since the 1980s, USGS scientists have computed the annual population index and evaluated trends in the southern sea otter. For southern sea otters to be considered for removal from threatened species listing under the Endangered Species Act, the population index would have to exceed 3,090 for three consecutive years, according to the threshold established under the Southern Sea Otter Recovery Plan by the USFWS. To reach the optimum sustainable population level under the Marine Mammal Protection Act, which is the number of animals that will result in the maximum productivity of the population while considering carrying capacity and ecosystem health, the southern sea otter population would likely have to reach as many as 8,400 animals in California. The sea otter survey and stranding programs are just one part of a larger research program investigating sea otters and their role as predators in coastal ecosystems. In Elkhorn Slough, located between Santa Cruz and Monterey, a recent study suggests that sea otters’ appetite for crabs can improve the health of seagrass beds, and USGS scientists are collaborating with biologists from the Monterey Bay Aquarium, the Elkhorn Slough National Estuarine Research Reserve, University of California, Santa Cruz and the CDFW to study the population in this unique habitat. A new study from UCSC, USGS and the Monterey Bay Aquarium is investigating how sea otters near Monterey are responding to the increase in sea urchins, which may be in part a result of loss of predatory sea stars from wasting disease. The scientists are studying whether sea otters play a key role in preventing urchins from overgrazing kelp forests in the absence of sea stars. The annual population index is calculated from visual surveys conducted via telescope observations from shore and via low-flying aircraft along the California coastline by researchers, students and volunteers from USGS, CDFW’s Office of Spill Prevention and Response, Monterey Bay Aquarium, UCSC, USFWS and U.S. Bureau of Ocean Energy Management. This year, the surveyed coastline spanned from Pillar Point in San Mateo County, south to Rincon Point near the Santa Barbara/Ventura County line, and also included San Nicolas Island. Sea otters were presumed extinct in California after the fur trade years, but were rediscovered in the 1930s, when about 50 animals were documented persisting near Bixby Creek north of Big Sur. 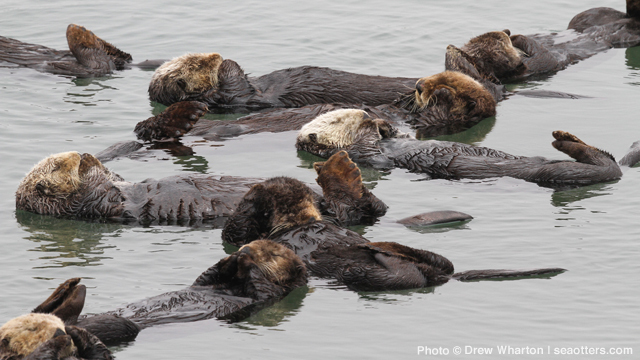 More detailed survey results and maps are available in the full report “Spring 2016 California Sea Otter Census Results,” which is available online.